While the effects of cavitation are generally undesirable with respect to rotating machinery such as propellers, impellers and turbines the opposite is true when applied to fuel injectors. When a fuel injector discharges a very high velocity liquid stream under enormous pressure is accelerated through an array of orifices, depending on the design. As the flow streamlines converge through the exit the velocity of the fluid increases and according to the Bernoulli principle this causes a pressure drop. When the internal fluid pressure drops below the vapor pressure of the liquid being injected cavitation bubbles form. The diagram shown below taken from www.fluid-research.com and generated using CFD (Computational Fluid Dynamic modeling software) depicts an ejection fraction saturated with cavitation bubbles. In the case of the CCES there are six ports in the modified Ford injector and the fluid being ejected is water rather than diesel fuel. The rationale here is that the bubbles improve fuel dispersion and this leads to more complete combustion. In our case we are not interested in combustion, but we are interested in generating heat and converting all of the water to superheat steam. When cavitation bubbles either collapse or are crushed significant energy is released. Under certain circumstances this energy can exceed many thousands of degrees Kelvin. 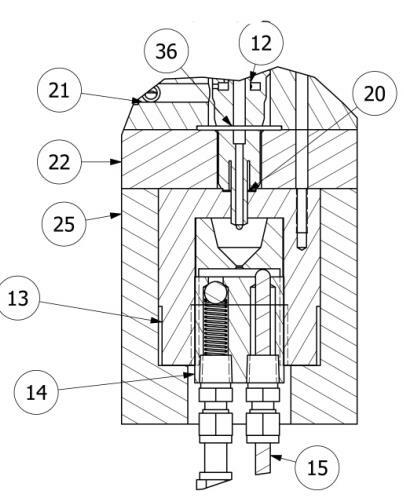 In the CCES device the impact chamber wall is positioned close enough and at such an angle to the ejection port to create a shock wave within the impacting water droplet. This occurs within a time frame such that the water is still in a liquid phase when the collision occurs. The diagram below depicts the compressing water droplet. 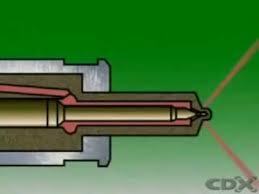 The water hammer pressures within the droplet can spike to levels exceeding the injector rail pressure. Some of the water is changing phase due to the ambient heat within the impact chamber and the balance undergoes compression and further heating caused by the energetics of bubble collapse. If there was no heat generated the impact chamber would be cooled and its temperature would rapidly decrease as the steam is released. This is precisely what happens when liquid water is sprayed onto a hot metal surface. The opposite is observed as evidenced in the 5:03 minute accompanying video. In the case of the CCES the device generates hundreds of thousands of bubbles many time a second for each injector. The resulting heat and hence steam are the essence of the invention. Based on our calculations an eight impact chamber steam CCES will use approximately 5 horsepower to produce 250 pounds of steam per hour.